As an aside, I buy Continental tires for our daily drivers. They are great tires; but really, the reason I stick with them is because of their involvement as a major sponsor in road racing. The Continental Tires Sports Car Challenge series is fantastic. Lately, the TV coverage has been thin, but I’m able to see all the races. I used to go to NJMP to see them in person – I would have really liked to see them at WGI. The closest they get to me now is at Mazda/ Laguna Seca, but I have not had the chance to attend yet. TLDR; I support companies that support the racing I enjoy. Anyway, the trailer pulled just fine. The springs are a little stiff – I may experiment with removing a leaf. It would be nice to get rid of the rattly ‘slipper’ springs and put some springs with dual eyelets on instead. Seems like an expensive fix to a small problem, though. I try to reverse up the driveway… the trailer says no. Backing up is a bit of a joke with such a short tongue. It just wants to turn 90degrees to the vehicle. It’d be cool to replace the tongue with a 2″ square tube that was a few feet longer: it would be easier to maneuver and it could provide a receiver in the back for a bike rack. This might happen. I’m gonna need a spare. I’ll bolt it underneath and hope I never need it. Some message board posts suggest getting a hub and bearing, too. I’ll have to kick that one around a bit. Flyin’ Miata Hidden hitch installed! Yep. It’s hidden. 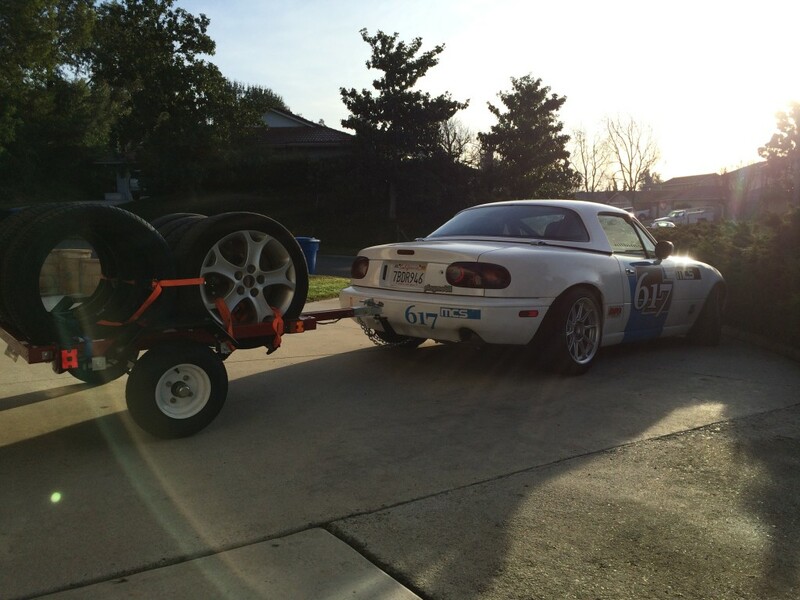 I decided to pick up Flyin’ Miata’s lightweight hitch. It cost more than the Hard Dog or the Curt models, but I felt the weight savings vs. the extra capacity was a good compromise. They mention that it’s only a 8lb increase after you remove the ball & tongue to race. Not too shabby. 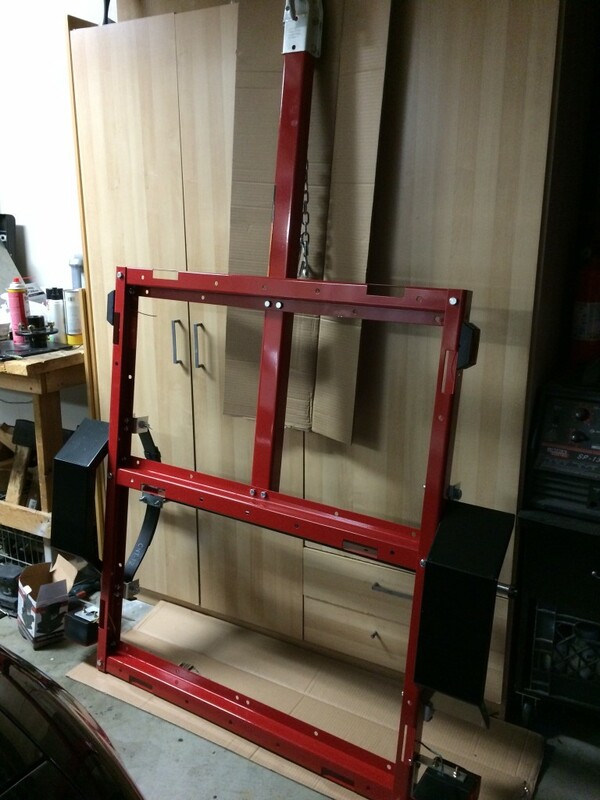 The hitch itself looks to be made from sheet steel that is laser cut / bent / welded, rather than square tubing. I like the design. 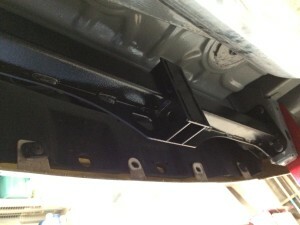 My car already had the factory rear tie downs removed and a track-approved toe hook installed. After drilling out the threaded sections in the rear of the car, I tapped the hitch into place. I moved my tow hook to the other side of the mount where it looks like it’ll do it’s job just fine. 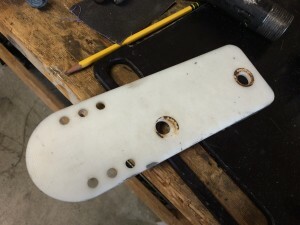 I did end up taking off my 3d-printed transponder mount: I’ll make a new transponder holder that plugs into the receiver. 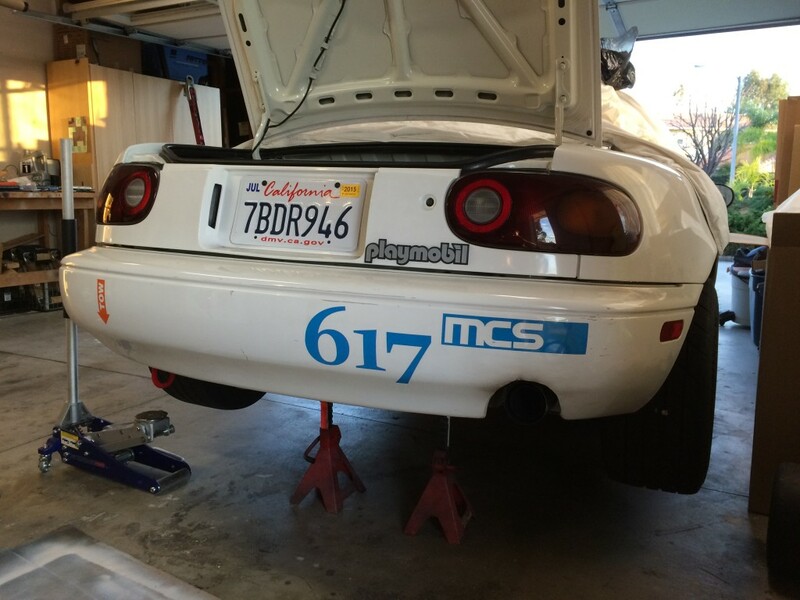 Flyin’ Miata offers a hitch adapter with approved 2″ holes to be used as a tow hook, but it looked too heavy to me. I kind of dig the way the ball mount looks, too. It reminds me of the German OEM hitches you’d see on a Westfalia or a Sprinter. 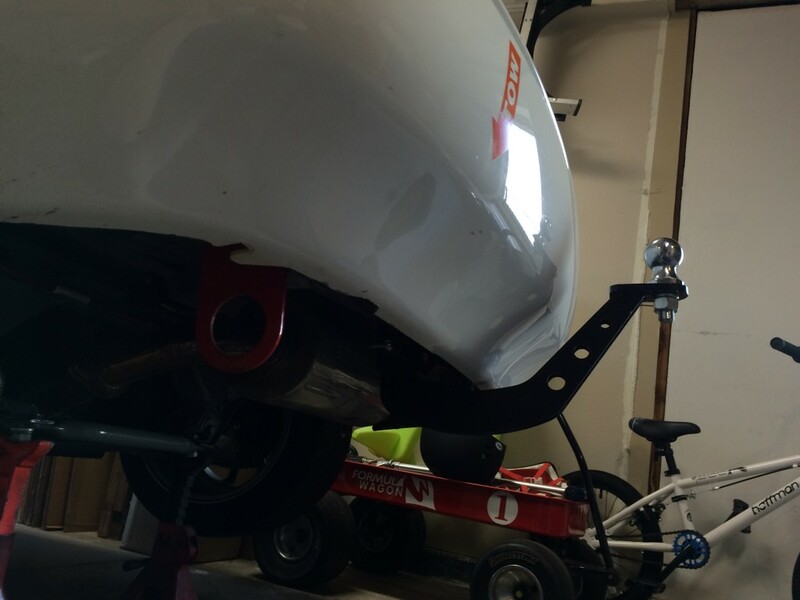 I have a few other projects planned in the short-term for The White Car: a battery & bracket upgrade that will negate the hitch weight and a quiet exhaust. The polished monstrosity on the car is a terrible fitting, awful sounding thing. The sooner I can distance myself from it, the better. Well, that escalated quickly. Right now, I’ve got a functional flat-bed trailer for less than $500 that can be towed by any of our vehicles. I do feel like I need to spend more $$$ and time on this thing; I really want a couple heavy-duty pit boxes and a place to mount race tires. 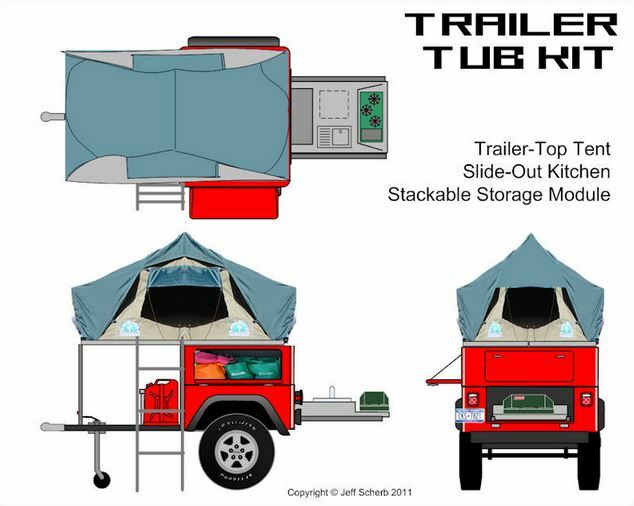 Maybe a roof-top tent to eliminate hotel costs on race weekends? I’m not sure I’m the guy for that job, but we’ll see. I sourced a 20% coupon for Harbor Freight from the awesome site http://www.hfqpdb.com/. If I had the patience, I could have waited for a 25%, but whateva. I headed down to HF and bought model 42708 ‘870lb 40×49 util trailer’. 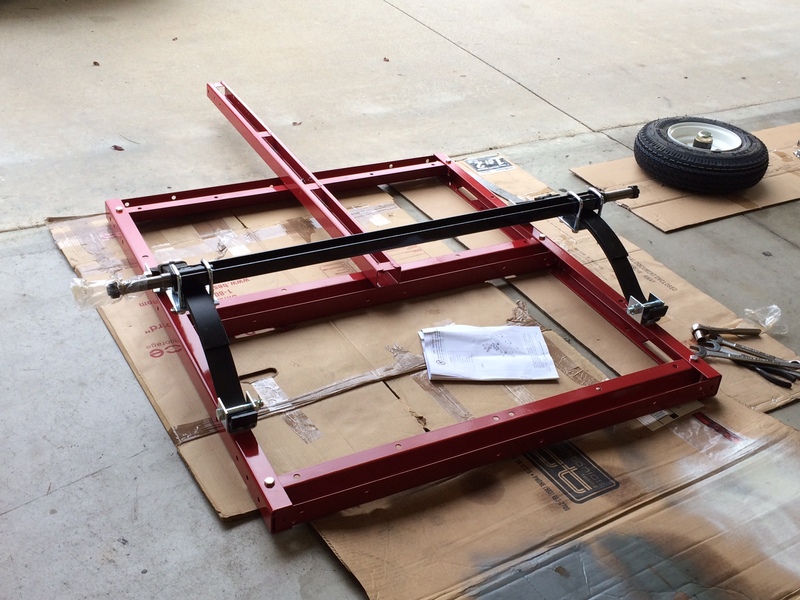 It came in 2 small boxes – 1 for the axles and frame rails, the other had the wheels, lights, fenders, etc. It went together very quickly. I decided to assemble the axle under the springs with the stock spring pack. I suspect I’ll need to remove a leaf to soften the ride (I did on my fold-able 4×8 kart trailer), and I may need to flip the axle to lower it (!) to match the height of the Miata. Besides, who doesn’t love a lowered trailer? I cleaned out all the factory grease that the bearings/ hubs came packed with. I’ve read a few horror stories about it not working as it should. I repacked and filled with a Moly grease, but I can’t figure out why I just didn’t use the Mobil Synthetic wheel bearing grease I use on everything else. Oh well. Lets see how well it holds up. With these little wheels we should be turning some impressive RPM’s – and that equals HEAT. I hitched it up just as it was built to the Mazda5, and drug it to the DMV. A worker there said he couldn’t inspect it until I put a top onto it (?!?!) I shot over to Lowes and bought a cheap piece of 1/8″ plywood and asked one of the guys to rip it to size. After throwing it onto the trailer, I literally strapped it to the trailer with ratchet straps. Done. Deep carpet desk mat looks great for under $25! The plywood was $14 for the 4×8 sheet, and now I had a 4′ square left over. 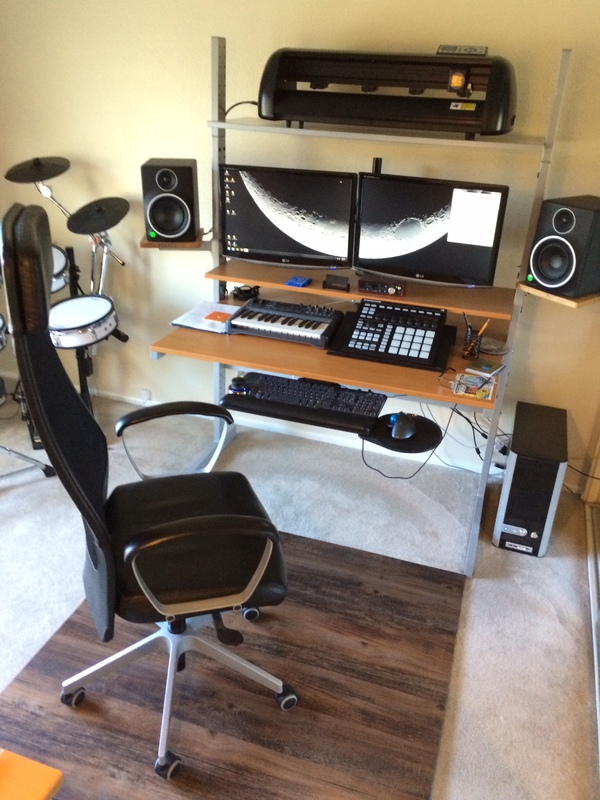 Lately, I’ve been looking for a solution to stop my desk chair from sinking into the carpet. The padding on the carpet is quite thick, and the standard plastic ‘Office Depot’ type mats just crack and break. After wandering around Lowes, I found some 6″x48″ self-stick flooring. Boom goes the dynamite. I sanded and painted the wood a dark color, then stuck those bad-boys on. Thick carpet office desk mat. Works great, and my expenditure for the trailer’s wood goes to $7. After several hours at the DMV, I walked out with a plate and a registration for the next 5 years for $21. The $500 Pickup Replacement Project! 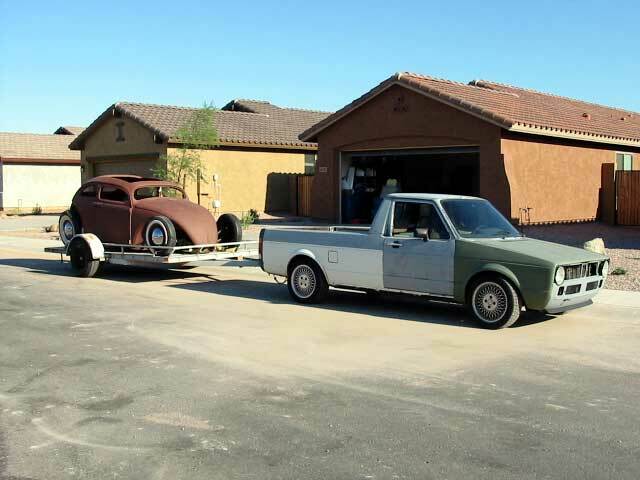 I sold my Rabbit pickup; I need something for Home Depot and Craigslist treasure runs. I no longer have use of my father’s Chevy 1500/ dual axle trailer to haul the White car and spares to the track. For track days, I’ll need some way to get tires and tools there. The Rabbit Pickups had a nice, usable, size bed but couldn’t haul much weight. I could haul stuff like engines, but I couldn’t (shouldn’t) tow a car with it. (I did actually). This limitation is fine with me. A used pickup truck will require fuel, registration, insurance, and maintenance. 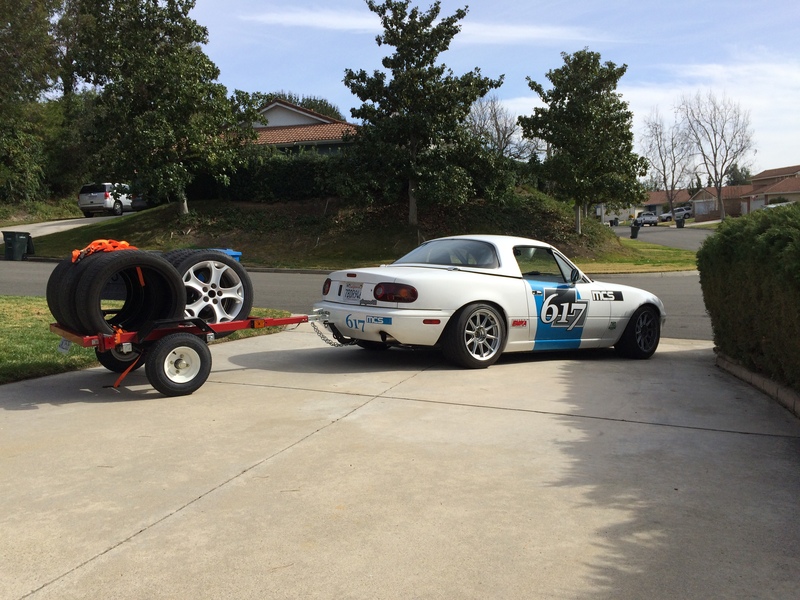 It’d be nice to tow the Miata to the track, but… budgets, man. Budgets. The trailer needs to be registered every 5 years for $27 here in CA. No insurance. 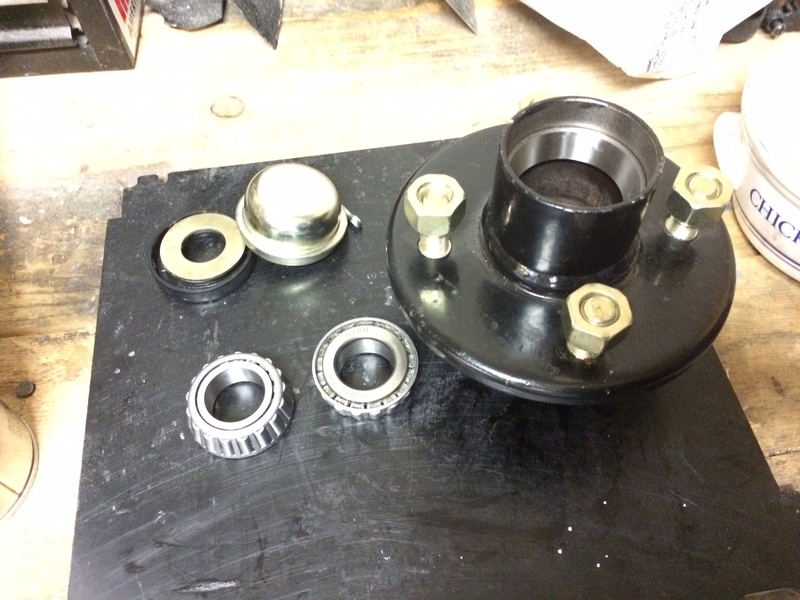 Axle bearing & tire maintenance will be needed. 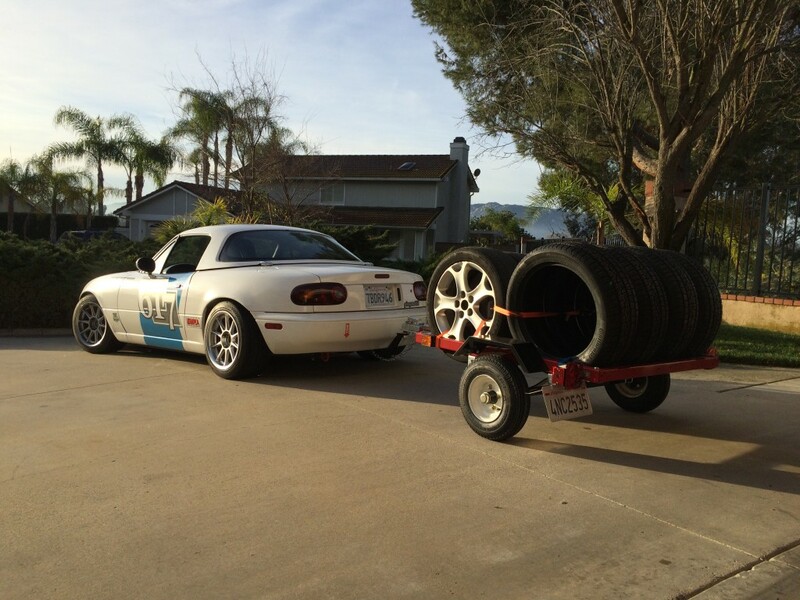 There are a lot of folks using a small trailer behind a Miata to bring tires to an autocross, etc. This is where I’m going. OK, so I’ve decided to get a little utility trailer. 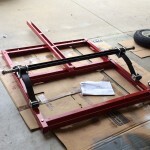 I’ll get a Harbor Freight trailer: cheap, complete and cheap. It’s cheap, too. I want the 4′ vs the 8′ bed because of storage space when not in use. It will be stored more than it will be used. I want the smaller tires (8″ vs 12″) again because of storage space. 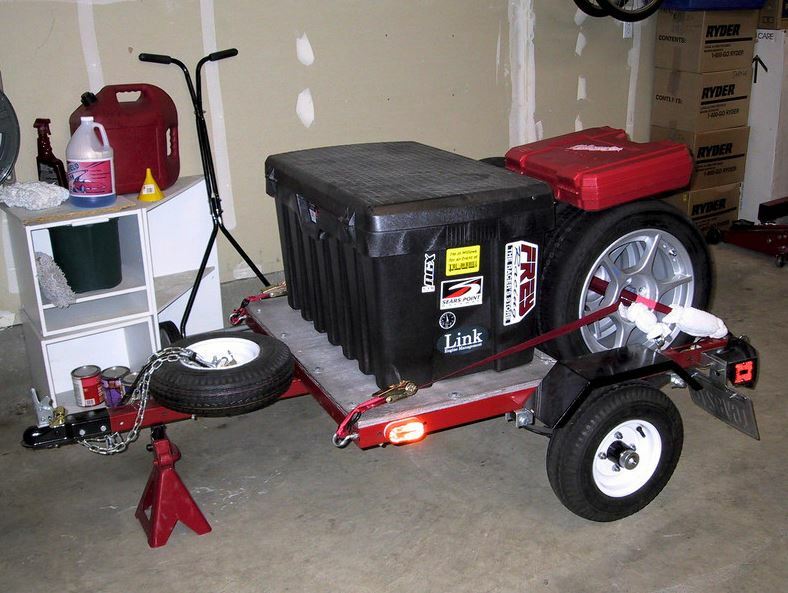 HF has a 4×8′ with 12″ wheels that folds: I did own this trailer years ago with my kart. It was great, but still, too big. even when folded up. Think small. 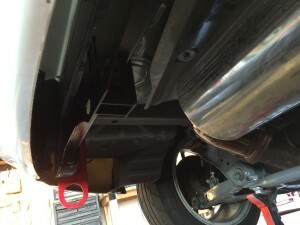 I have a Curt Hitch on the Mazda5, I’ll look into options for the Miata. Maybe something removable? Will I simply bolt on a piece of wood for a flat deck? This is probably the most versatile solution. Maybe a pair of plastic toolboxes? This could be used as lockable storage and the top could be used as a platform to tie stuff to. A wooden ‘box’ to do the same as above? Will that be too heavy empty? Should I extend the tongue an extra foot or 2 for maneuverability? Hitch receiver on the back of the trailer for a bike rack? I have a 2 bike rack for the Mazda5 that would work great. Will I store this thing inside or outside? It’s not big, but yeah, it takes up a bunch of precious garage space. Lastly, I don’t want to spend much money on this thing that will sit around most of the time… so let’s say there’s a $500 cap on this project. Stay tuned.